This week I’m participating in Five Minute Friday. FMF is pretty much what it sounds like – set a timer, write for five minutes on the prompt provided. It’s been a great warm-up before throwing myself headlong into the writing train that is Write 31 Days. This week’s Five Minute Friday writing prompt is: POTENTIAL. When I move something that’s in danger of falling, like a glass too close to the edge of the counter, I generally think of it as removing some of it’s potential. It’s just an old snippet of high-school surfacing, when that was a running joke between my friends and I, picked up from an introductory physics class. We weren’t moving something, we were “removing its energetic potential.” We’re removing some of the risk that it’s going to fall, and reducing it’s energy. And my mind moves to one of my favorite quotes, and strikes a spark against the first thought, from potential to falling to flying. This leads me to thinking about how, when I oh-so-carefully curate my life, I reduce my risk of falling, and I reduce my risk of flying, and I reduce the potential of my day, and rob my life of its energy, both useful and damaging. And I think about how I’m like an abused cat I fostered years ago, that had to be taught to play. Gentle reader, I do not recreate well. At all. Work is fun, because that’s how I was raised, and how I’ve been shaped to live my adult life. No time for unproductive fun. I’m the first to offer a hand when someone is painting or remodeling or moving, but if they invite me to a housewarming party, I’ll usually find a reason not to go. I don’t gravitate towards fun. Here, in my 40s, I’m trying to learn how. I don’t even know what I like to do. I have to concentrate to notice what enjoyment is. This is SO not the life I want. Bill: You know what I mean. Every choice I make in this moment, here and now, could change the whole future. The Doctor: Exactly like every other day of your life. The only thing to do is to stop worrying about it. It’s only in fiction about time travelers that we worry about how our every action affects the future, but that’s every day, right here, right now. Today. Everything we do today affects our future. Every. Little. Butterfly. Flap. Spending a little time on a class instead of Twitter could entirely lift a life from one set of tracks to another. It raises potential and risk and the chances of falling and/or flying. Because there’s no separating them from each other. Time to start guiding that pesky little chaos butterfly, instead of just letting it get blown around. I suppose that’s my takeaway, today. I have to allow that today/tomorrow might turn out well. There’s the potential of flying just as much as there’s the potential of falling. They can’t be separated. There’s no flying without some element of falling. In case you’re having a bad day, here’s a photo of a man local to Eugene, who flys kites every single day. 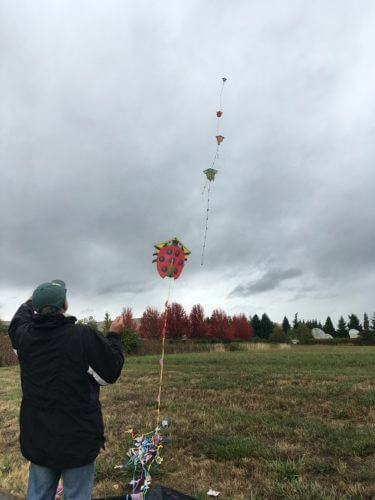 On the day in the photo, October 12, 2017, he was celebrating his 1,000th day in of a row of kite flying. I love when I run across him on walks. This entry was posted in Anxiety, Eugene, Five Minute Friday, General, Kites, Life after divorce, October, Oregon, Self care. Bookmark the permalink. I love the thought of falling as leading to flying. We all fall in life, make mistakes. Those mistakes can lead us to great victories of flying. Just a thought. I agree, it can be easier to see the potential pitfalls at times rather than to allow for the potential that it could go well! But it’s true, we have to take risks if we want to have the potential to fly! I love the kite picture- that sounds like a great way to bring a little joy into each day! The Kite Guy is great. He and I have had some fun conversations, and you have to love that kind of persistence. Rain or shine, snow or ice storm, he puts at least one kite in the air, every day. And yeah, potential is physics…mass times height times the gravitational constant. In rock climbing, the equation is balanced, because it equals FUN! OK, yeah, I’m a walking concussion protocol. Why do you ask? I’m so glad you commented, Andrew. This is a crackup! Thank you for the much-needed smile. The closest I’ve come to rock climbing is a scramble up the back of a butte, here. It was wet, and about halfway up I realized I’d better find a way to go up and over, because there was no way I was making it down the way I’d come up.